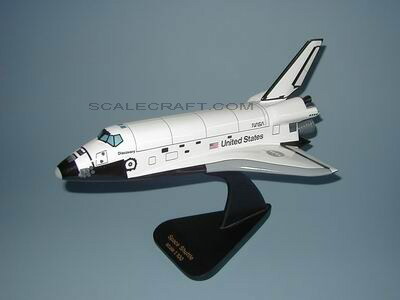 The Space Shuttle takes off from Earth as a rocket and maneuvers in orbit as a spacecraft. After reentry into Earth's atmosphere it is controlled and brought in to an unpowered landing in the mode of a conventional fixed-wing airplane. The Shuttle takes off vertically under the power of three Rocketdyne main propulsion engines, each developing 375,000-lb. thrust, plus two Thiokol solid-propellant booster rockets, each producing 2,900,000 lb. thrust; the combined thrust being 3,091.5 tons. Orbital speed of the Shuttle is 17,600 mph, and landing speed is 212 mph. Mahogany wood. Scale 1/100. Wingspan 9 1/4 inches, length 14 1/2 inches.